Vinalhaven Farmers’ Market features fresh veggies, seedlings, milk, beef, lamb, goat cheese, eggs, seafood, fiber products and goats milk soap. 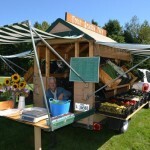 The market is open Tuesdays, 4:00pm-7:00pm, and Saturdays, 8:00am-12:00pm, at the Flea Market Field in downtown Vinalhaven, on the corner of East Main Street and Atlantic Avenue. Watch for the signs as you pass through Trenton on Route 3 in order not to miss this little gem of a market! It is located at the Trenton Grange, which is adjacent to the Narrows Two Campground. The market is held every Wednesday from 3:00pm to 6:00pm.